Following up on the issue of using quotations in slides, a couple of people have asked how to take a book cover and change its shape as I have done in the example here (and in the post below). Here is a very rough outline of the steps (I have used the Beyond Bullet Points book for the example). First you will need Photoshop or some other photo editing software that allows you to distort selections and save them as PNG files. (1) Scan the book cover, or go to Amazon and copy the image of the book cover (click on it to get the larger size image). 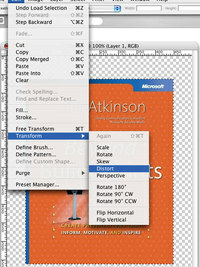 (2) Open the book cover image in Photoshop. (3) "Select All" and copy the entire image (but do not paste yet). 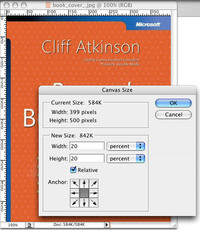 (4) Go to "Image" in the menu bar and select "Canvas size...". Here you will want to add about 10-20% (depending on the size) to the height and width of the canvas to give you room to distort the image. (5) Now that the canvas is bigger, "Paste" the original book cover image (it is still in memory or "clipboard" remember). (7) Go to the "Edit" menu and choose "Transform" then "Distort." You will see little boxes on the corners and on the sides. These are the areas you can click and move to manipulate the image. Just experiment with moving the image around until it looks the way you want. "Skew" and "Perspective" are also very useful for manipulation, so experiment with these features. 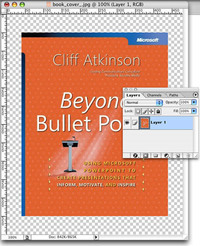 (8) If you want a drop shadow under the cover, double click the layer to get the pop-up menu called "Layer Style." Check the "Drop Shadow" box under the Blending Options on the left. 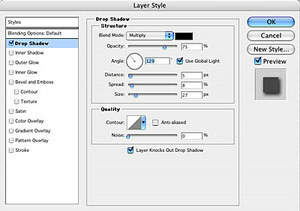 To adjust the shadow (the default is not very good) click on "Drop Shadow" to the right of the checked box to reveal the Drop Shadow settings. NOTE: If you have Keynote on the Mac, then you can ignore all this since the drop shadow settings within Keynote itself are wonderful — you can just add shadows later as you need them. (PPT has "shadows" too, but they are not good, natural-looking ones). (9) When the cover looks the way you want it, then crop the canvas to cut out any extra area. (10) Now choose "Save As" from the file menu. Save as a PNG file if you want the canvas area to be transparent. If you want the area around the cover to be white (because your slide background is white, for example) then save it as a JPEG. 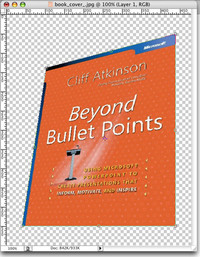 The advantage of using a PNG file is that you can place the cover into any kind of background and see only the book cover, not the canvas. 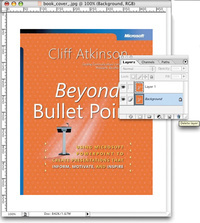 If you choose to save it as a JPEG with a white (or any other color) canvas area, then the book cover will look good only over a white background where the canvas area appears to disappear. The advantage of JPEGs is that the file size will be smaller. My explanation does not do justice to the procedure because it is actually very easy and fast – if it were time consuming or difficult I would not do it. And you can skip this entire process and insert the book without any manipulation, of course. In fact, if I am just showing a picture of the book cover, I do not change its shape at all. But if I have a quotation on the slide (and want to include a photo of the book) I can get a bit more space for the quote. Usually, the quote takes up two-thirds and the image one-third of the slide, more or less. This manipulation of the perspective of the book cover allows the cover to be a little larger while at the same time allowing more space for the quotation. All of this must be done without creating a feeling of crowding or noise, however, in the slide. 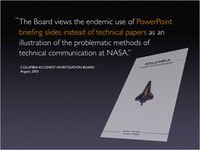 Displaying quotes in your presentation slides can be a very powerful technique. Depending on the presentation, I often use quite a few quotes from various fields to support my points. Quotes can indeed add credibility to our story. Slides containing quotes also serve as guides or "reminders" to keep us and our story on track. A simple quote is a good springboard from which you can launch your next talking point, though you need practice to pull it off smoothly. Quotes should be short in most cases since it can become quite tedious when a presenter reads a paragraph from a screen. Below are samples from some of my recent presentations. When I read these quotes, I usually can keep my eyes on the audience at all times since the quotes are short enough to be easily memorized. I can easily catch the graphic (such as the head shot of Albert Einstein) which appears next to the quote with just a quick glance of my peripheral vision. The graphic is for the benefit of the audience, but it also helps me instantly recognize the content of the slide without having to really look at the slide. If I am quoting from a book, I will often include an image of the book cover. 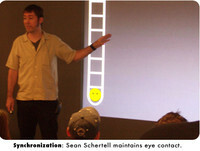 A simple image is used for the slide on the left. For the slide on the right, what could be simpler than...no image at all? I often look to different fields for inspiring comments. In this case, Jazz. On the left is a slide that would not be unusual today. On the right is a more professional treatment of the quotation. I first learned of Henry Boettinger's 1969 book, Moving Mountains, from Cliff Atkinson's excellent presentation blog. Here, Cliff uses the quote that I placed in the two slides above. Cliff used this quote in his web seminar while showing a good visual which evoked the feelings of "high voltage" and "connection" (or "conversation"). 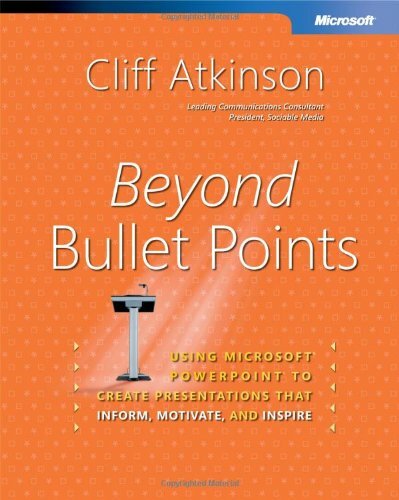 As Cliff mentions here, in the actual web seminar, he used the quote sans any text in the visual. This worked fine, but usually (not always) it is better to have the quote appear on screen. 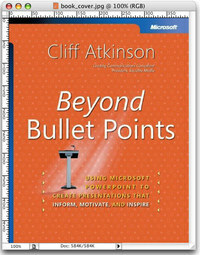 However, as Cliff points out, using "...a range of approaches in a live presentation environment" is best. Consider the following five "effective presentation principles" — are these precepts not good advice for delivering effective presentations? (5) Keep to the middle. In fact, these five above are not "effective presentation principles" at all, they are Jigoro Kano's Five Principles of Judo as outlined by John Stevens in Budo Secrets. It is easy to see, however, how these principles can be applied in our efforts to design and deliver presentations. For example, you may have witnessed a presentation where the speaker could have done much, much better if he had only embraced the wisdom of principle number (4) — know when to stop. There are times when you may speak longer or shorter than planned, but it must be a conscious decision based on the context of the moment and by following principle number (1) — observing oneself and the situation, observing others and the environment. This is just one small example illustrating the application of such principles. In a seminar environment, I could imagine having good discussions about these principles and how they could be applied to everyday business such as presentation design. 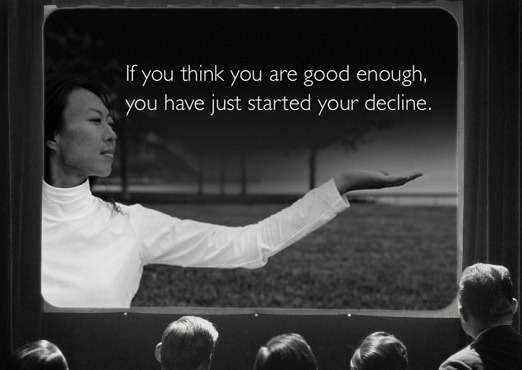 "If you think you are good enough, you have just started your decline." No matter how good your last presentation (or bad for that matter), what matters is how to improve. This is good advice for most all endeavors. Jigoro Kano founded Judo in the late 1800s, and although Judo was not based on the principles of Zen outright, Judo is seen by many to be a great expression of Zen precepts. I have a lot of respect for people who dedicate themselves to the art of Judo. 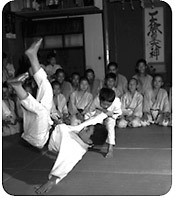 Judo is more than a sport or a mere physical activity born in Japan. To those who practice Judo, the lessons, wisdom, and experience gained serve to help them in profound ways in all aspects of life. Jigoro Kano summarized the essential goals of Judo. These are noble goals in life and in business. Can they not be applied to a presentation context? Make no mistake, "minimum effort" does not mean to slack off or give less than full commitment to the moment. Rather it implies the use of experience, intelligence, and skill. In the presentation context, it could translate into simple yet powerful visual support, a delivery style that makes complex data accessible without confusing, endless, overly verbose explanation. Sometimes, for example, a short story (minimum effort) can have a huge and lasting result (maximum impact). Presenters often seem focused only on their content from their point of view. Audiences — especially potential clients — want to know "what's in it for me?" Presentations should be two-way; they should be conversations. And while it sounds like a cliché in 2005, "win/win" should be the goal. 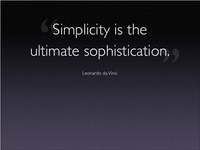 No presentation is perfect, of course, but we must aim for perfection. Content, design, style, evidence, engagement, all of this is important. But in all our business dealings, including presentations, we must always embrace too the ideals of integrity, honesty, character, kindness, and so on. It is never just about winning the contract, as lofty a goal as that may seem at the moment. This idea need not be confined to the mat. Think about the last challenging presentation you had that just did not go as well as you had hoped. Perhaps there was more "pushback" than you expected. Could you have done better by engaging your audience and answering the difficult questions while "reacting spontaneously and naturally without hesitation and without purposeless resistance"? In my experience, when I have received challenging questions from a skeptical or even hostile or aggressive person, a natural, non-aggressive response from myself always was more effective than showing any irritation or defensiveness. Butting heads is very easy to do, but usually leads to a sure defeat for us as presenters. At some point, we will encounter a hostile client or an audience member who may be more interested in making us look foolish or derail us during our talk than getting at the truth. It happens. The key is to remember that they are never the enemy. If there is any enemy at all, it is in within us. Even if an audience member does choose to assume the role of "opponent," our irritation or any display of anger will surely not do us or the rest of our audience (99% of whom may support our views) any good at all. "Victory over the opponent is achieved by giving way to the strength of the opponent, adapting to it and taking advantage of it, turning it, in the end to your own advantage." Many years ago I was giving a presentation to a large group. It was going very well. But one person in the audience often interrupted with irrelevant comments to the point of becoming a distraction for the audience. I had many occasions to become angry (but did not). I could sense that the audience felt I was going to rip into the guy if there was one more interruption. And frankly, they would not have blamed me. But I always was respectful to the man and did not show any irritation or anger. After the presentation, several people complimented me on my handling of the "interrupter." The ironic thing was that although the boisterous man may have intended to damage my effectiveness, he actually had the opposite influence. By flowing with the moment, not butting heads — which only would have made things worse — and showing self-control I gained respect from the audience. This in the end made the presentation more effective. This was very much unexpected and was a good lesson for me. In the beginning, we may have to work at just not showing our irritation to the audience. But through experience and practice, it is possible to not even feel irritation in the first place when challenged. More on the history of Judo. Last week, a great Osaka-based bass player and I backed a couple of cool jazz guitarists in one of the biggest Starbucks cafes in Kansai. We all had a blast. I deeply enjoy playing music for people. I love it because I'm energized by communicating and connecting in creative ways with new people. It's a feeling that is hard to put into words. Sometimes a great seminar or presentation will leave me feeling exhilarated too because I feel that, in my own little way, I made a difference in someone's life. Maybe I inspired them, or helped them in some small measure. Playing music is a performance and also very much a presentation. Good presentations are after all about conversing, sharing, and connecting at an emotional level in an honest and sincere way. It doesn't get much more honest than jazz. It is even easier to connect when playing music since everything is really laid right out there in front for everyone to see and hear. There are no politics, no walls. The music may touch them or it may not, but there is never even the hint of insincerity, questionable motives, or of being anything other than what people see before them at that moment. The smiles, the heads nodding in agreement, and the feet tapping under the tables tell me that we are connecting. It's a fantastic feeling. Usually when I play a jazz or a blues gig in the city, I have a larger kit of drums. But moving drums is quite problematic in such an urban jungle like Osaka. So for the Starbucks sessions I followed a Zen-like principle of using only what is absolutely necessary to get the job done. I employed a kind of drumming minimalism, if you will. I knew that to support the guitar and bass, I would only need the essentials. So, a month ago I purchased another drum kit to go along with my regular set. The new set is designed for portability and is called the Pearl Rhythm Traveler. I only used the 14" bass drum from this kit and added my vintage 1966 Ludwig snare, and Paiste high-hats and ride cymbal. This was all I needed for this particular situation. Having fewer drums is easier to move, of course, but it also was very liberating musically. The fewer drums and cymbals I use, the more I get out of what I have. 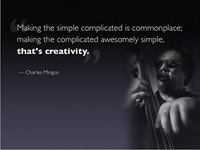 It is more challenging and creative. And most importantly, a minimal kit was the most appropriate choice for the moment. Just as a minimal, yet high-quality, drum kit was the most appropriate equipment choice for the Starbucks venue, there are also times when I decide that I will use a whiteboard for a particular presentation and leave the projector at home. Or I may bring some high-quality lap visuals to pass around the table, or a combination of whiteboard and paper. It all depends on the context and circumstance. There are certainly occasions when using a projector in a boardroom is like bringing in an 18-piece drum kit to a small jazz club. It will work, but it's unnecessary...and it can serve as a wall. You will be surprised how free and creative you can become sometimes without the use slides and the hum of a projector. And since the competition is likely using a standard deck of bulletpoint-filled slides, your analog, minimalist approach may just differentiate you and demonstrate that you have thought more about your client's needs. Earlier this summer I read Peak Performance Presentations by Richard Olivier & Nicholas Janni. There are two fundamental beliefs behind this book. The first is that all presentations are performance. 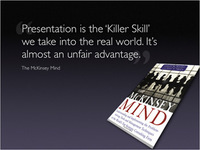 The second is that most of us are not operating anywhere near our peak presentation performance. I agree with this, of course, and I too am always looking for ways to be inspired and kick my own presentation skills up a level or two. Over the weekend I attended Cirque du Soleil in Osaka and came away amazed and inspired. Frankly, had I not been invited, I probably would have never seen Cirque du Soleil in Japan. But since I always encourage people to stretch themselves and try new things outside the office — you just never know where inspiration will come from — I welcomed the chance to experience something new myself. We were the guests of marketing manager, Montse Moré, who has been with "Cirque" for several years and has been instrumental in making the Japan tour a big hit. Montse was a most gracious host. The show touring Japan is called "Alegria 2." By definition the show is a circus, but honestly, I did not feel like I was at a circus at any point. Instead, I felt I was at the theatre. From costume and make-up, to stage design and special effects and lighting, the entire production was a testament to the creative human spirit. The music is what really brought it all together for me. Rather than have the band in a pit, for example, the band was a part of the show, dressed in costume and placed at the rear of the elevated stage in full view of the audience. The two female vocalists had stunning and powerful voices, yet somehow their singing had a soothingly mystical quality that fit perfectly with the fantasy world we entered. The vocalists, too, moved all around the stage and throughout the audience. After the show, Montse took us back stage and gave us a tour of the whole traveling show. Go to the Fuji TV site to view some behind the scenes photos and a feel for what it is like on the road in Japan. Even if you think you are not a fan of the circus, your will love Cirque du Soleil's Alegria. If I had a team of creatives — or a team of sales people — I'd take them all out to Cirque du Soleil. Entertaining and fun, yes. But also inspiring. Don't let technology or props take away from the experience. In Alegria 2, there are many scene changes requiring different equipment and prop set-ups. Usually in live entertainment, such as during concerts, we see men dressed in black t-shirts lurking near the stage and darting in and out to set-up equipment changes. But at Alegria 2, from the the moment we entered the circus tent we never once were aware of the technical support, though it was certainly there in the dark. And on stage, all prop and equipment changes were done by the cast members themselves in full character so that the illusion of the fantasy was never broken. 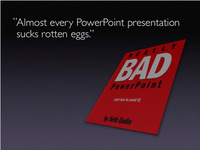 Too often in presentations given with PowerPoint, we are all too aware of the software and computer, but the technology should be as invisible as possible. While setting up, for example, don't have the screen on until your first slide is already in play mode. Many presenters actually allow the audience to see the computer screen boot up and then watch them mouse around for their PPT file. We also have a chance to glimpse the desktop picture of the presenter's new baby before the first slide appears. How wonderful...and how irrelevant. All of this subtlety takes away from the moment and from the purpose of the presentation, which is about the message and the story, not what software you are using. Connect with the audience. Mingle among them. Bring them "on stage" from time to time. At Alegria 2, I felt the cast was not apart from us, instead they were a part of us. We were not just watching a show, we were a member of a live event. There are many things we can do to engage with our audiences too, big or small. From eye contact to smiles, to asking questions and asking for volunteers to help with a demo. Each case is different, but one thing is clear: An audience that feels they are a part of it and shown the respect of engagement from the presenter (or artists) are more likely to pay attention, to listen, and in the end, to "get it." Pace. At no time did the show drag. The two-hour show went by in a flash. Every act ended with you wanting to see just a bit more, yet the show never felt rushed. 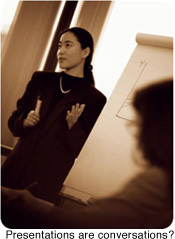 In the business world, many presentations drag on and on with superfluous or gratuitous points. Better to have the audience wanting a little more, rather than filling them up to the satiated point. Little mistakes can happen, so what? Move on immediately to what is important. I noticed one slip and gracious fall on to the net during the Super Aerial High Bar. The point was not the one slip, the point is amazing the audience with the 1000 other things that are going right. The audience does not even notice small mistake as they are often engrossed in the big picture. In a presentation context, the audience does not know (or care) if you forgot to insert a slide or if the color is not as perfect as it was on your PC. Why dwell on the small imperfections? Sure, if there is a mistake or change in the data, that can not be over looked. But when small technical errors occur, remember the "show must go on." Next time you see a professional performance of some kind, ask yourself how you can incorporate some of their technique and skill in your next presentation. To some degree, every presentation is a performance. In the mean time, try to see a live performance of Alegria if you can.